There are a couple of overall themes in this collage. One is an expression of the Kabbalistic concept "as above, so below" - whatever exists in the spiritual realms exists here on Earth too, to a different degree (and vice versa). For example, there is the highest Abba and Ima, the parents/lovers that created everything, and then a "lower" Abba-Ima on the Tree of Life as we understand it. Adam and Eve in Eden are a "lower" expression of Abba-Ima, and also the highest expression of man and woman. Our ancestors in the spirit world (above Jesus' head) are watching over their descendents; they are reflected below as suffering humanity struggling in the powerful current of life. The blue, starry heavens above and the rock and river of Earth below - both exquisitely beautiful. A second theme is that of ascending and descending: movement between the worlds, the connection between above and below. The angels are ascending on the right. The light is descending on the left. The Creation process in the center column of the collage is a descending movement from Abba and Ima all the way through to the Colorado River. Source: Marc Chagall's Lovers In The Red Sky (San Francisco Museum of Modern Art ). See more about Abba and Ima on the Tree of Life page. Abba and Ima give birth to the giving and receiving of the Torah at Sinai. Abba and Ima are the source of all material manifestation. They don't create the Torah (which springs from the breath of God as letters in black fire on white fire). What Abba and Ima do is bring together God's breath and human ears, through Moses. Source: Chagall's Moses Receiving the Tablets of the Law (Centre Georges Pompidou, Paris). The Sages say that God consulted the Torah prior to Creation. This means that the Torah is the blueprint for Creation, and the Hebrew letters and words are building blocks. For Jews, Christians and Muslims alike, the Torah (Old Testament) is the foundational scripture furnishing the basis for our laws and ethics. For me personally, the combination of images: Abba and Ima and the giving/receiving of the Torah, is an expression of my love for Jews and things Jewish. And also an expression of the creative power of mutuality. 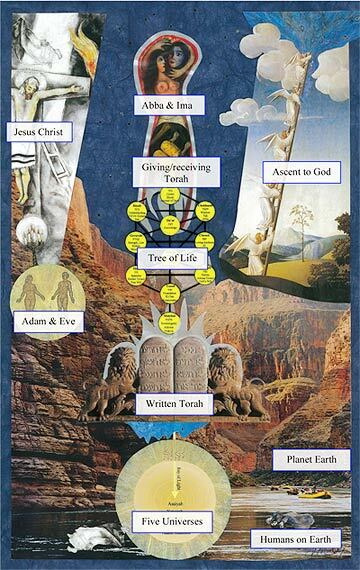 Source: This depiction of the Etz Chaim (Tree of Life, in Hebrew) is from the tradition of Rabbi Isaac Luria of Safed, considered to be the greatest Kabbalist of all time. The diagram shows the Sefirot and the twenty-two paths between the Sefirot: the relational matrix. For more information, see Tree of Life. I placed the Tree in the center of the collage to express its central magnitude. The Tree sustains everything depicted on the collage, the artists, everyone seeing the collage, and everyone who has never seen the collage! Source: A wooden representation of the tablets containing the ten commandments, flanked by the lions of Judah. This image represents the Torah received and held by humanity. . . the ten commandments that govern our lives. . . Judaism and the community of Israel. This is the Torah brought through by Abba and Ima above - manifesting here on Earth below. Source: This is a depiction of Creation from the Lurianic tradition. The Ray of Divine Light (Kav Or) emanates the five universes from its source in the holy name of God (YHVH). These are five dimensions of reality/consciousness ranging from our material world to the heavens most high that surround and imbue everything with holiness. I put this at the bottom of the collage because the beginning and the end of the creation process is happening constantly. God creates the worlds ongoingly, in every moment. Source: Chagall's The White Crucifixion painted in 1938 (Art Institute of Chicago). This is a powerful and beautiful image of Jesus Christ with a tallis, a Jewish prayer shawl covering his loins. He is a Jewish Jesus, with the light of the traditional candelabra at his feet, and with the ancestors above his head, calling to one another. I love this image that is also an expression of my love for the Christ consciousness and the teachings of Jesus. Adam and Eve had two incarnations. The first was living in the heavenly realm of Eden where they wore garments of light. The second is here on Earth, where they (and we, their descendents) have garments of skin. This image is a metaphor for our divinity and our (often very funky) humanness - which exist simultaneously. Source: Jacob's Ladder (L'Echelle de Jacob c. 1490 - Painting School of Avignon). This painting is based on the story of Jacob's dream of a ladder extending from earth to heaven, upon which there were angels going up and down (Gen. 28:12). To me this is a metaphor for the eternal exchange between heaven and earth. This up and down, running and returning, occurs within us as we fluctuate between calmness and urgency (for example) and also beyond us as great cosmic currents. The photo of the gorgeous Grand Canyon and Colorado River is an expression of the power and beauty of Earth and our life here.